A private airboat experience for small groups and is well-suited for bachelor or bachelorette parties. Experience a very personal trip which is half ride and half tour with a local guide. Enough seating will be provided for your group to be together. As a private tour experience, passengers are allowed adult beverages on your vehicle and on the private airboat tour. 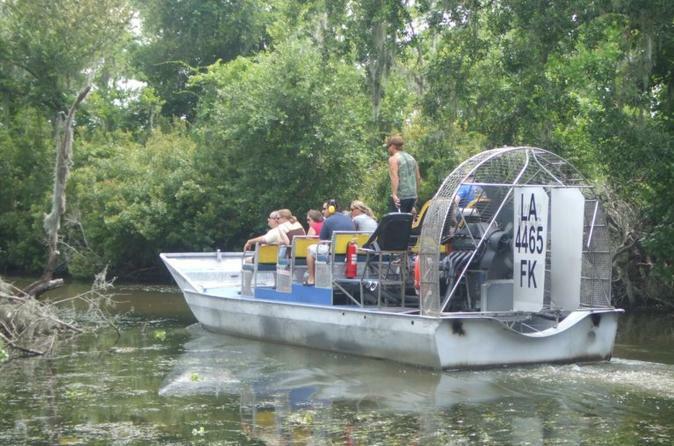 You will arrive at the swamp tour dock and board the comfortable 16-passenger airboat with your experienced captain. You will get up close and personal with gators and more. Guests spend an unforgettable 1 hour and 40 minutes on the water as they party in the swamps of Louisiana. Meet your guide at any location in greater New Orleans. Your ride could be in a black 10-passenger van, a white 14-passenger minibus, or a 20-passenger minibus. Pickup time is your choice of 8:45 a.m., 10:45 a.m., 12:45 p.m., or 3 p.m. The driver will provide an ice chest or two for your use, and will stop a local shop for snacks and refreshments (alcoholic or non, it's up to you). The airboats are powered by a 454 Chevy engine that will produce speeds of up to 35 miles (56 kilometers) an hour. They are propelled by a huge fan that will blow air from the back of the boat in excess of 200 miles (321 kilometers) an hour. These tours are truly a blast! They ride in inches of water and go where traditional boats cannot go! The boats were designed to take you to inaccessible areas of the swamp, places that you cannot reach by foot or car. It is a unique experience. This is a fast and fun thrill ride that will last a lifetime! After your swamp tour is complete, you will be returned to your point of pickup.